7.86 points at 35 votes (rank 119). Scientists have discovered a mysterious structure in another dimension. To research its origin, the whole section needs the get mapped. This honourable task falls to you, the technical junior assistant sub worker of the “Mapping” department. For your investigation you receive "Gerald", a gyro-shaped, remote controlled vehicle. As the whole thing is a project of the government, the money is short. But you need money to provide energy for “Gerald”. If you discover new sectors of the area or collect jewels, you instantly get new energy for "Gerald" (and with this more time to play). You will need it, as the area has about 400 sectors and each sector fills out the screen. The world that you need to research consists of a labyrinth of ramps, stairs, jumps, bridges, gangways, one ways, lakes, trampolines and ice areas. These need to be transcended with great skill. If Gerald falls down, this will cost energy (time). A system of switches and lifts poses logical problems. Certain places of the world are only accessible by a lift, but the lifts need to get activated by switches. But often enough are these switches or lifts blocked by obstacles, which in turn need to be removed through other switches. As only a maximum of two switches can be active at the same time, you really need to puzzle at some places how to access the lift. And lastly there are also dangerous "inhabitants", which you should not touch as they steal you energy (time). Spindizzy can also be played with two players. The two player mode is very unusual though. One player controls the gyro up and down, the other player left and right. Detailed 3D graphics (view diagonally from above) with changeable direction of view and many different structures (ice, water, building, bridges, lifts, etc.). The map of Spindizzy is immensely big, more than 380 screens! I.e. : Playing time of about 3 hours until the whole world has been mapped. Unfortunately, it was saved on sound. = Fire button, to start the game with the set options. H = Help – show a screen with the most important elements in the game. Press any key to get back to the title screen. = push joystick into all directions (also diagonally) to move Gerald in the desired direction. = push joystick into all directions (also diagonally) to move Gerald in the desired direction with high speed. SPACE = Gerald gets more road grip. Can be used to stop, but also during moving. But needs much energy (time). F1 , F3 , F5 , F7 = set the different directions of view. After pressing the key M you see a map of the Spindizzy world (north is up). It gets automatically mapped during the game. The time is not reduced while you look at the map. To continue playing press any key. How much percent of the game you have already solved. Different switches can have the same symbol, but they do not have to have the same effect. Lift and the corresponding switch have the same symbol, but they don’t need to be on the same screen. The clear switch, switches of both switches. Its symbol is a rhomboid with dots at the corners. There are only a few inhabitants in the Spindizzy world, but these are very dangerous. They are virtually attracted by Gerald and during a touch they steal him very much energy (time). Therefore you should avoid this species. Buy a big package of paper, a 100-bundle of pencils and take a holiday for one year, then also you will belong to the few junior assistant sub-workers of the “Mapping” department, who have solved 100% of the game Spindizzy! Without noting down the trickiest points it is impossible to get to know more than 35% of the world. For this use the cheat mode of the “Remember” version. To start with, you should try the eastern world of Spindizzy, it offers the least puzzles and the time is counted down more slowly. You should always follow the hints that are given (at the lower left of the screen). Most of the time it is impossible to overcome these points without the displayed switch. 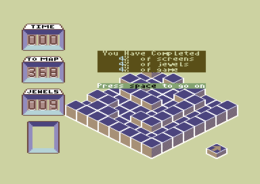 A detailed map of the whole world of Spindizzy can be found under Lösung on C64Games.de - Game No. 729 . The longplay video (link see below) is really worth seeing! In about 2 hours the world of Spindizzy is mapped. Here you get an impression of how some of the puzzles need to be solved. If you want to get from point (A), where every game starts, to the south-western world, your way will be blocked by a water ditch and a solid wall (screen B). Here hides a tricky puzzle. Notice the hint in screen B in the lower left of the screen. It says that in this screen a switch with the same symbol needs to be activated. You should follow hints like these in Spindizzy. This switch (4) is situated in screen C. The problem here is, that at the exit of screen C there are two interrupters, which deactivate all switches when leaving the screen. Now you have the possibility to switch on the lift (6) with switch (3) and jump with Gerald over the interrupters. You will see the next problem, as soon as you try this. In this room only one switch can be active. If you switch on the lift, the other switch will get activated and vice versa. The solution is to first press the switch for the lift and when the lift is about 5 mm over the highest step to then press the other switch. The lift now stays in its position and the switch that you need according to the hint in screen B is active. Now the interrupters can be jumped. For this you will probably need several tries. Now you can return to screen B. You will notice that in the wall a gap has formed. The last action now is to push switch (2) to create a bridge over the ditch. Now the way to the south-western world is free. The version by "Remember" has the cheat mode option to stop the time. Use this option at the beginning, this way the game is still hard enough. H.T.W: "First it is fun, then it is addictive and finally it drives you insane . . . this was written in some test report about Spindizzy and this statement literally "hits the mark", because I couldn’t phrase it better. It is fun, when you have comprehended the controls, you don’t want to stop, when you made it to map about 15%, and it almost drives you mad if you cannot get over the same point for the fifth time and you run out of time. . . ! To summarize: a pretentious and almost insolvable game with good graphics and much puzzling (now what does that switch do?). Spindizzy is absolutely recommendable for everyone who wants to spend " a bit" more time with a game!!". AR: "I actually have collected all jewels and went through the whole map some years ago. But I was a bit disappointed that nothing happened after that, i.e. no extra screen or exit or something similar. I even went back to the starting point, but this also had no special effect. Anyway, a nice game, which had me occupied for a few hours." Shmendric: "I had Spindizzy on a disk somewhere at that time, but I had no manual for it *cough*. So I just explored and tried things out and revealed the map more and more. Decades later I find out from the C64-Wiki that this was exactly the whole purpose of the game. And what I wondered about the function of the i key, which changes the gyro into a ball - no purpose, only an easteregg? Interesting :) In any case this game is rather addictive if you have no idea about the background and the story. I never made it to discover more than 40-50 rooms, I have respect for the people who have gone through this. 380 rooms, wow!" 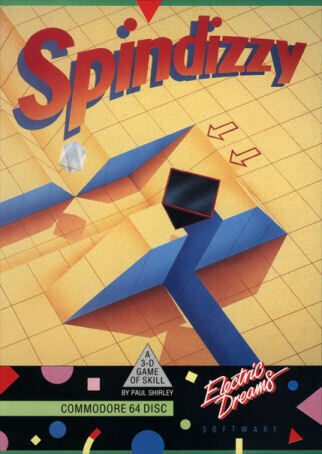 The original version of Spindizzy was created by Paul Shirley for Amstrad CPC. 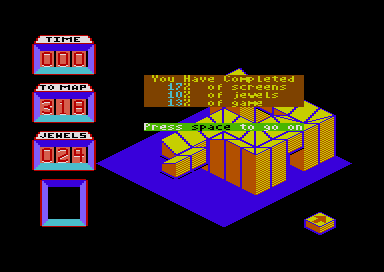 While many of the conversions were made by other programmers, Shirley developed also the C64 version using Amstrad CPC as development platform. In the version by „Remember“ the saving and loading of a score as a new and important function was added. For Amiga and Atari ST there was a successor named "Spindizzy Worlds" in 1990. Paul Shirley initially created the sequel for Atari ST before developing slightly improved version for Amiga. Later SNES conversion was created by ASCII for Activision without involvement from Shirley. This page was last modified on 11 September 2016, at 16:08.